We are really excited for the Noise Pop Film Festival this year. We've selected some amazing new films, all focusing on music but each approaching the subject with a distinct voice and fresh perspective. With screenings at the Roxie, Viz Cinema and the Artists Television Access (ATA), each show is not to be missed! See all descriptions and purchase tickets below. Please join us for our Reception at Viz Cinema on Thursday, February 25 to celebrate the films in this year's Noise Pop Film Festival. Many of the filmmakers will be in attendance, including Ryan Page and Christopher Pomerenke, of Blood into Wine and The Heart is a Drum Machine. 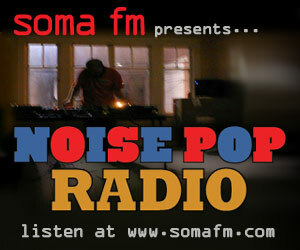 Meet your fellow fans and enjoy music hand selected by the Noise Pop staff. There will also be free food and wine from Wente Wines, Trumer Pils, Honest Tea, Cabot Cheese, Peasant Pies, Pepple's Donuts and Mission Minis! Internationally known as 'The Live Music Capital of the World,' Austin's music culture has led it to become one of the world's most sought-after destinations. As nearly two-dozen high-rises pop up throughout the city amidst economic downfall, how does the working musician get along? This lyrical documentary provides a telescopic view into the lives of Austin's vibrant young musicians as they grapple with questions of artistic integrity, commercialism, experimentation, and the future of their beloved city. Nathan Christ’s directorial debut is a cultural portrait of the modern American city examined through the lyrics and lens of its creative class. At age 9, Priscilla, an adorable yet precocious little girl, tells her single-father, Jesse, “I am going to become a rapper and fulfill your dreams of succeeding in the music business.” Moved by Priscilla’s passion and impressed with her natural talent and undeniable charisma, he begins to teach her all he knows about rapping. In the four years that follow there is no question that rapping has brought Priscilla closer to her estranged father, and that her success has made him proud. Before our eyes, this father-daughter duo go from a one-bedroom shelter in Harlem to a 4 bedroom apartment, from food stamps to shopping sprees, from rapping on street corners to sold out night clubs, and from sneaking under train turnstiles without the $2 fare to spare to being driven around in tinted SUV’s. It is further undeniable that Jesse has been reborn, from looking at old photos and bitterly reflecting on how he never was given the respect he deserved in the music business as a rapper himself to finding his own voice and self-respect as his daughter’s overzealous manager. But in the efforts to make her dad proud, Priscilla struggles to remain a child and finds herself trapped in a world of people twice her size and four times her age and doesn't know whom to trust. Jesse himself is caught between wanting to protect his daughter’s innocence and exploiting her raw talent to fulfill his deferred dream. All they know is that the ride has just begun. Q&A with Director Gabriel Noble and Producer Marjan Tehrani following the screening. FREE DRINKS and a chance to meet some of the films directors and producers! Blood Into Wine is the widely anticipated documentary that shares the story of Tool/A Perfect Circle/Puscifer front man Maynard James Keenan and his mentor Eric Glomski as they pioneer winemaking in the hostile deserts of Arizona. Featuring Tim & Eric, Patton Oswalt and Milla Jovovich. Why music? Artists and scholars grapple with the question in this cinematic look at a uniquely human obsession. The Heart is a Drum Machine is a new feature documentary film project from the producers of Moog. Featuring an impressive cast of musicians, music historians, critics and scientists including MTV's Kurt Loder, Tool's Maynard James Keenan, KCRW's Nic Harcourt and actor/musicians Elijah Wood, Jason Schwartzman and Juliette Lewis. Featuring Fab 5 Freddy, Bobbito Garcia, Jazzy Jay, Mos Def, TV on The Radio, DJ AM (RIP), James Chance, and many more. Narrated by Debbie Harry. In this film by Rian Johnson (Brick, the Brothers Bloom), John Darnielle performs “The Life of the World to Come” on piano and guitar. Shot in the same building where, as an eight-year-old piano student and new transplant to Claremont, he performed Bach minuets for the state examiner, The Life of the World to Come takes the songs from the album and restores them to their raw original states: skin, blood, and bone. chronicling the journey from initial ideas to the eventual completion of his latest record, 'Goodnight Unknown'. Narrated by Lou himself, this film offers rare insight into the fascinating mind of the influential artist. Featuring never before heard demos as well as original music and soundscapes recorded exclusively for this documentary. Also featuring appearances from fellow musicians, Dale Crover (Melvins, Nirvana) and Imaad Wasif (Folk Implosion, Alaska!, Yeah Yeah Yeahs). Directed by Adam Harding. Woodstock: Now & Then explores the frenzied days leading up to the festival, from how the planners scrambled to find a concert site and the traffic jams that shut down the New York State Thruway to the notorious "brown acid" to the thunderous rain and mud and, of course, the music. Weaving together first-hand accounts with rare archival images and an iconic soundtrack, the documentary allows those who were there a chance to relive the experience and gives an entirely new generation an opportunity to feel the magic of that time. The film also takes an important look at Woodstock's legacy through the eyes of today's musicians and activists, examining why Woodstock and all it symbolizes is still relevant in today's culture. This is a film about the redemptive power of rock-and-roll. It’s a film about the American South, where rock was born. It’s about a band, straddling the borders of rock, punk, and country. It’s about making art, making love and making a living. It’s about the Drive-By Truckers. “The Secret to a Happy Ending” documents the band and their congregation of fans as they explore tales of human weakness and redemption. While DBT songs are often dark, their whiskey-soaked concerts raise joyful hell. With the filmmaker’s unparalleled access, “The Secret to a Happy Ending” documents three critical years of touring and recording – years in which the band struggles to overcome the trauma of divorce and survives a near breakup, as they persist in their search for a happy ending. In February 2004 independent filmmaker Barr Weissman proposed making the documentary. After several discussions with the band, filming began in January 2005 and wrapped up in October 2007. Following a long twisted road, editing was completed in November 2009. All My Friends Are Funeral Singers Trailer from Califone on Vimeo. Zel is a fortune teller. She works out of her century-old house removing clients’ aches and pains, advising gamblers and channeling cranky spirits for a quick check-in with their loved ones. For as long as she can remember she has shared her home with a group of ghosts — a priest, a bride, a mute child, some washed up vaudevillians and a noisy group of sight-impaired musicians — who pass on incredible knowledge and abilities from beyond the world of the living. All goes on at the family homestead as it has for generations, until a mysterious light appears in the woods. The ghosts suddenly realize they are trapped and forge a rebellion, tormenting Zel with all the aggravation and insanity they can muster. When Zel uncovers the origins of these spirits, she is forced to choose between her comfortable if strange existence and letting go of the only family she has ever known. Zel’s unique story is a lesson in hope, habit, and folklore. The atmosphere is utterly enchanting, an odd realism tinged with humor and wonder. Angela Bettis, respected cult actress known for roles in MAY and GIRL, INTERRUPTED delivered an extraordinary performance as Zel. Superstition, sound and the intricate details of the claustrophobic house feed the film’s construction, allowing the story to unfold like music. This is no surprise, as writer/director Tim Rutili is also a founding member of the band Califone, who appear in the film and provide the lush original soundtrack. With his unique gift for memorable melodies, lovelorn lyrics and wry musical stylings that blend classic Tin Pan Alley with postmodern grooves, brilliantly idiosyncratic singer/songwriter Stephin Merritt has distinguished himself as one of contemporary pop’s most beloved and influential artists. This remarkably gifted and prolific tunesmith records and performs as a solo artist and also leads numerous alternative bands including Future Bible Heroes, the Gothic Archies, the 6ths and, most famously, the Magnetic Fields, whose 1999 three-disc opus 69 Love Songs is widely considered a masterpiece of traditional songcraft and irresistible synthpop. In conjunction with the Magnetic Fields’ Bay Area appearances closing the Noise Pop music festival, SF360 Film+Club presents a sneak preview of a new documentary about the intensely private Merritt. Shot over ten years, this beautifully photographed film follows the indie-rock curmudgeon, details some of his personal relationships (most notably with Claudia Gonson, his childhood friend, bandmate and manager) and provides insight into an artist who has produced one of the most engaging and confounding bodies of work in the American songbook. This is a unique opportunity for an advance look before the documentary has its world premiere at a closely watched U.S. film festival in the spring. Guests expected for a question-and-answer session following the screening include Merritt, Gonson and director Kerthy Fix. Presented by the San Francisco Film Society.